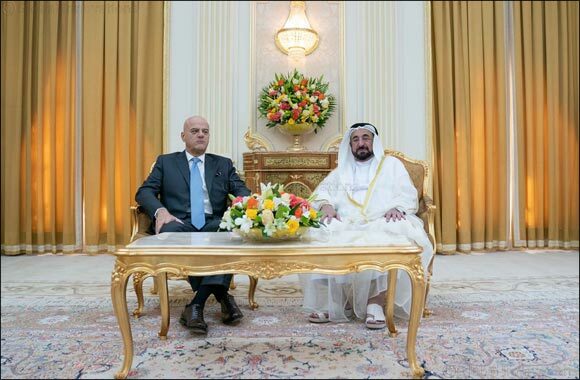 SHARJAH, Sharjah Government Media Bureau, January 14, 2019: His Highness Sheikh Dr Sultan bin Mohamed Al Qasimi, Supreme Council Member and Ruler of Sharjah, received this morning (Sunday) in his office Claudio Descalzi, CEO of Eni, Italy’s largest energy company, in the presence of HH Sheikh Ahmed bin Sultan Al Qasimi, Deputy Ruler of Sharjah and Chairman of Sharjah Petroleum Council, HH Sheikh Sultan bin Mohammed bin Sultan Al Qasimi, Crown Prince and Deputy Ruler of Sharjah and HH Sheikh Abdullah bin Salem bin Sultan Al Qasimi, Deputy Ruler of Sharjah. On this occasion, HH Ruler of Sharjah signed a long-term agreement awarding Eni three long-term concessions to explore and develop onshore oil and gas fields in a 30-year partnership with the Sharjah National Oil Corporation (SNOC). The agreement was also signed by Claudio Descalzi, who represented Eni and lauded the Emirate's research and development efforts in energy, oil and natural gas, stressing these efforts support sustainable energy and offer diverse sources and discoveries to serve future generations. HH Ruler of Sharjah and the CEO of Eni also discussed a number of energy, oil and natural gas-related issues, as well as future projects aimed at ensuring the sustainability of energy. HH Ruler of Sharjah also witnessed the signing of an agreement between SNOC and Eni, inked by Hatem Al Mosa, CEO of SNOC, and Claudio Descalzi, CEO of Eni, affirming cooperation between both parties in oil and natural gas. There was considerable interest in the Licensing Round due to several attractive factors -- the improved images from the 3D seismic survey that was completed ahead of the bid process, coupled with an attractive fiscal system, the availability of existing infrastructure and a growing market for these products. “We are delighted to welcome Eni as our partner in Sharjah. Eni has an excellent track record in both exploration and development and brings both technical expertise and the ability to move ahead with activities at a fast pace,” said Hatem Al Mosa, CEO of SNOC. “I would like to thank all the companies who participated in the process. SNOC plans to conduct License Rounds for additional areas in the future,” he said. This award follows completion of the first Onshore License Round conducted by SNOC on behalf of the Sharjah Petroleum Council. The objective of the License Round was to select suitably qualified partner(s) in order to accelerate the exploration, appraisal and development of the hydrocarbon resources onshore Sharjah.